The AICUO Award for Excellence in Visual Art has had yet another great awards reception. Thank you for all that came to Otterbein University Wednesday night. We appreciated all of your support and enjoyed making it possible to reward our winners with a great audience. 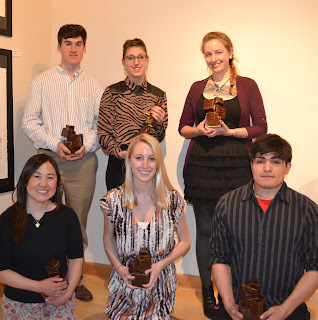 Congratulations to our winners: Erin McKenna (CCAD), Julio Labra (AAC), Brittany Kunkel (Denison), Taylor Hawkins (CCAD), Kristy Kemper (AAC), and Mayumi Kiefer (Ohio Northern). Thank you for all of your hard work and participation in this competition. Congratulations to Erin McKenna, our 2012 Grand Award Winner and to Brittany Kunkel, our 2012 People's Choice Award Winner! Takeshi Moro began the evening by moderating our panel of six winners, where we learned about each individual artist; their aspirations, current artwork, influences, and experiences during college. Lauren Zachrich, senior fine arts major at Otterbein University, was very gracious and welcoming as she presented the audience with a tour of the art facilities. Otterbein’s catering was definitely a highlight of the evening. There were many delicious food items to choose from. Thank you Nicholas Hill for setting up the gallery space for AICUO! Congratulations to Hannah Mason-Macklin, our awards design competition winner. 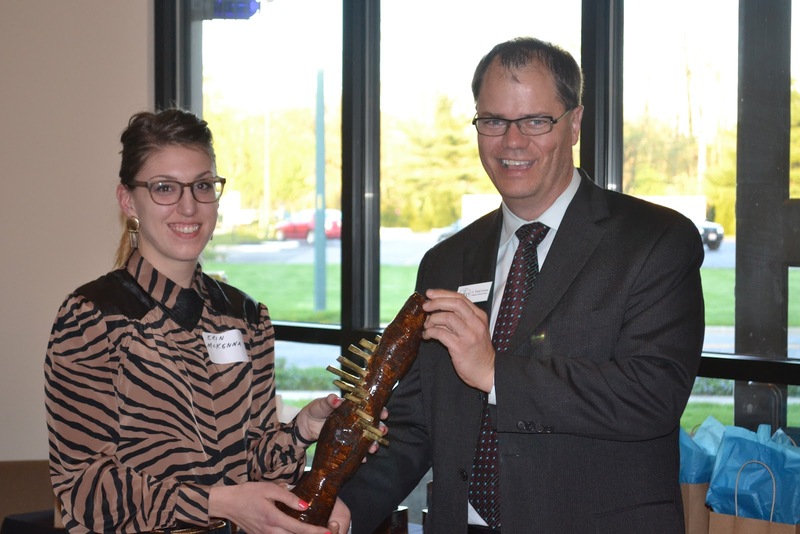 We received many compliments regarding the awards made by local artist Bryan Kossmann, who built Hannah’s design into ceramic artwork. We were honored to have State Representative and Otterbein University alum Anne Gonzalez, representative of the 19th District including areas of Central Ohio, present legislative commendations to our six winners. Thank you to Professor Carrie Olson, Professor Danielle Julian Norton, Professor Luke Sheets, Professor Chris Yates, and Professor Mark Thomas for introducing all of the award winners. 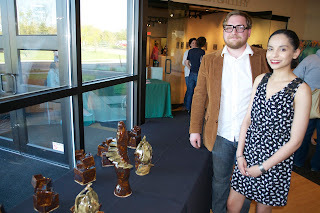 Although the EVAs are over, we invite the public to view the six finalist's pieces in the May 5th AICUO Walking Exhibition as a part of Gallery Hop in the Short North District of Columbus. Thank you again to all who supported this competition and participated! and AICUO President Todd Jones. and local artist Bryan Kossmann.